customized interactive “River of Life”. click on the illustrations of the timeline. The journey of our lives is unique, whether it is the life of an individual, a family, a team, an organization or a whole community. No other journey like it has been or ever will be embarked upon and yet, how often do we stop to reflect on where we have been, where we are now and where we want to go? By necessity, our hectic lives demand that we push forward to do more, create more and therefore “live” more. Yet living is about being aware of the now and being present in the journey so that we can truly live fuller and richer lives. 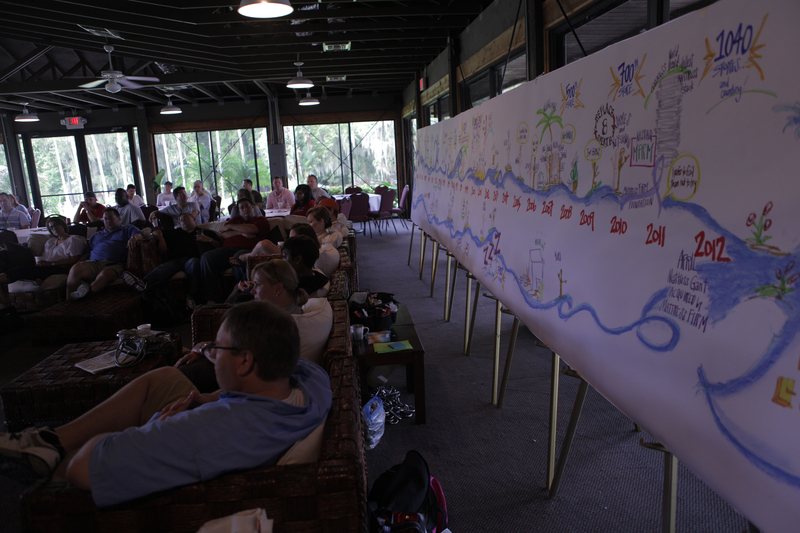 “The River of Life” offers a unique opportunity for individuals, families, groups, teams, organizations or communities to take a pause to reflect on the past, to learn in the present and to create the future. The event creates a sense of community, enrolls participants in the ongoing journey, instills a sense of belonging, educates on the historical past and inspires commitment to the future. Participants gather in a relaxed and comfortable environment and reflect on their journey as part of a family, team or organization. They tell stories, from the earliest memories, of the events that have brought them to this place in time. They relate experiences of the ups and downs, the achievements and small victories, the losses and the difficulties and challenges. Meanwhile, as all the stories unfold, they are graphically recorded on a huge mural by our graphic artist, Hannah Sanford. Matt Rutlin, our videographer, can also catch the event on film. The stories bring participants to the present and, at this point, they can reflect on those events and stories in an interactive, facilitated process and finally create the future that they all envision. Old photographs, news articles and magazine articles can be integrated into the story line and interviews with associates can be captured on film. All of the material that is documented on film and in graphics can be digitalized or reproduced in hardcopy to create a lasting, interactive story line of the group’s journey together. Honor or celebrate an associate’s retirement from an organization or recognize an anniversary or long tenure of a dedicated employee. Compile a book or digital compilation full of stories, photographs and memories of their journey with the company. Tell the story of the journey of your team or department and use it to plan the present and envision the future. Create a unified team committed to each other and to their common purpose. Include the organization in the storytelling process. We have facilitated the event with over 1000 people. You can also tell the story of a department or region. Hang the mural in your company office, revisit the journey years from now and map how you are meeting the goals you set for yourself. Map the course of two organizations coming together. Educate the participants on the history of each company as they come together so that they can understand the cultural make-up of each organization and the events that created each of them. Use the event to find common ground and a sense of “oneness” as they plan their future together and strategize the path forward as a new organization. Bring members of the family together to tell stories of the lives of the people creating a partnership together for the future. Create a powerful book or digitalized representation of their separate lives to this point using interviews with family members, real time story telling and past photographs and family memorabilia. They can even create the future they see together as an inspirational path forward. Gather family members together to tell stories of the deceased family member and create an everlasting digital or hardcopy documentation of their life’s journey that will be treasured by all family members. Celebrating their life brings healing and comfort to the pain of loss.